On the other side is a marshland, and just beyond that, the sea. Colt and mother feast on kelp and gallop along the seashore. This tale is a testament to the bond between mother and child, and the reassurance that a mother will always look out and be there for her young. Between the lines, one can read into the dichotomy of dark/light, trial/triumph and death/rebirth. 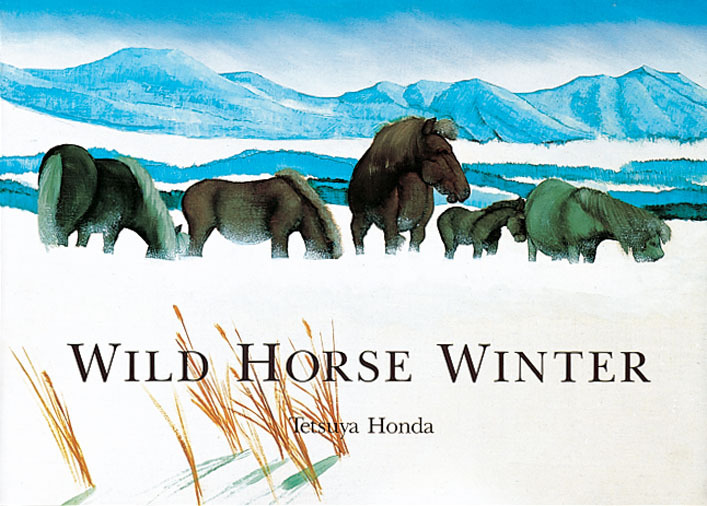 Wild Horse Winter is a powerful work that can be used in many ways either in the classroom or at home. For those interested in history and human-animal studies, the editor’s notes are fascinating. Three hundred years ago, visiting merchants and fisherman brought Nambu horses to Hokkaido, and left them there during the winter to fend for themselves. While many died, those Darwinian-survival-of-the-fittest-horses became their own breed, the Dosanko horses: shorter in height, longer hair, and tougher hooves. They adapted to blizzard-like conditions by doing what is portrayed in the text and images: lying down and letting the snow cover them entirely.